in order to make it easier to find the spices I'm looking for. Alphabetically works best for us. I have a friend that does alphabetically by sweet and savory. Here's what I finally came up with - I'm very pleased with this solution. The jars are from Amazon.com, the labels are printed using a Dymo LabelWriter Twin Turbo, and the shelf is a 3-Tier Bamboo Expanding Shelf from Container Store. Use a label maker if you have one. Having everything printed the same way makes it prettier and also easier to scan. Using exclusively the same type of containers simplifies storage and also makes it easier to scan. Put the labels towards the tops of the containers, so they're visible above the tops of the next row down. This stair-step shelf expands to fit the horizontal space available, and can probably fit about 60 containers, which should be enough for anyone. I've gone with alphabetical order, which I've found to work very well. It has the advantage of being objective - there's no question where something belongs, and no taxonomical discussions about what category nutmeg belongs in. As a bonus, this setup give me pleasure every time I look at it! I sort mine primarily by pairing the ones that are most often used together, like I have cumin and coriander together...just like oregano, rosemary and thyme. Salt and pepper will always be living next to each other in my kitchen. Whole spices like cumin, mustard and fennel seeds up top. In the Middle I keep powdered spices like paprika and turmeric, along with ground up blends like taco seasoning and curry powder made from the stuff on the top shelf. Bottom shelf has dried herbs (thyme, rosemary) and extracts (vanilla, almond). This way the most frequently used ones are on the bottom two shelves where I can get them easier. The mason jars fit together well, they fit great in the narrow cabinet two up two across and three deep. I have two methods that work well together: First, I keep different "families" of spices together. For example, the ginger, cumin and turmeric generally live near each other. I keep the oregano, thyme, basil and rosemary in their own area as well. The second method is to use different shapes/sizes of containers for different spices. Those which I use often and with different "families" (like salt, pepper or ginger) have distinctive shapes. Dried herps are kept in little round plastic boxes, whereas ground spices are generally in shakers. Another option is to have a spice rack on the inside of the cupboard door, where all the spices are displayed in a way that is easily readable. I keep them in a lower corner cabinet (lazy-susan style), stickers with labels on caps, like kinds together, most frequently accessed on the ends nearest the opening. My spices are too numerous to conveniently store in one spot. I usually buy bulk spices at Whole Foods, and refill my own shaker jars. When practical, I buy whole spices for maximum flavor retention, and grind them myself with a coffee grinder. Extra bulk spices and whole spices are stored in my freezer for longevity. Once ground (or in leaf form), spices go on a rotating carousel, sorted by category (green herbs, peppers and pungent spices, etc). Ones that receive rarer use (turmeric, garam masala) or came in their own shaker containers (garlic powder, onion powder) go in the cupboard. ALL of my spices have labels for when they were purchased. I've learned the hard way that it's the only way to make sure you're rotating spices before they lose the subtler flavors. Green herbs and ground spices lose their flavor especially fast, especially if they are stored in plastic bags or jars that do not seal well. I have two rotating carousels in my cabinet -- because of the height of my shelves, only small containers can fit on the top of one. I have spices on one, and herbs and extracts on the other. I keep them on tiered shelving units you can buy at any organization or kitchen store and I arrange them alphabetically. Two shelves gives me a first cut at sorting spices. I know which spices belong up, and which down. This roughly halves the size of the problem. After that, a large variety of different jar types makes each spice quickly recognizable. Big jars do for the popular spices, small jars for the ones I use once a year. The Oregano belongs in an old Rohrig scrip bottle from the 70's. Marjoram and Savory share a single bottle type, but have distinct labels. I put my "spice" rack on the back of the door to my pantry. I went to Bed Bath & Beyond and they have this over the door rack. The top two shelves are used for baking and the bottom two shelves are used for cooking. You can easily see every spice that you have and they are very accessible. I absolutely love having the spices this way. Not only are they easy to get to, but it also frees up counter space or shelf space in a pantry that would normally be dedicated for spices. Check out Alton Brown's method in Good Eats: velcro on the back of a cupboard door. Easy access and a clever way to maximize storage. Also, a great show! Use an organization scheme from inventory management: IDs or SKUs. Number the spice jars 1 to 100, for example. Then track them in a spreadsheet. Makes it very easy to find exactly what you need. "I need jar 5, 19, 20, and 41 for this recipe." (If you can't identify spices on sight, you might need to put the name on the jar too). ID 7. Chili. WHOLE. Jan 2012. Ancho (hot!). YES. ID 8. Chili. GROUND. Jan 2012. Aleppo (very hot!). ID 9. Cilantro. WHOLE SEED. Dec 2011. ID 12. Cinnamon. GROUND. Mar 2012. ID 15. Cinnamon. STICKS. Mar 2012. YES. ID 16. Cloves. GROUND. Apr 2011. ID 18. Cloves. WHOLE. Mar 2012. YES. ID 21. Cocoa. POWDERED, Mar 2010. Dutch-process; great for hot cocoa! ID. Makes it easy to find the spice you need. "I need jar 10." It also means you can skip the alphabetizing and/or grouping of spices. Cinnamon right next to the onion flakes? No problem! 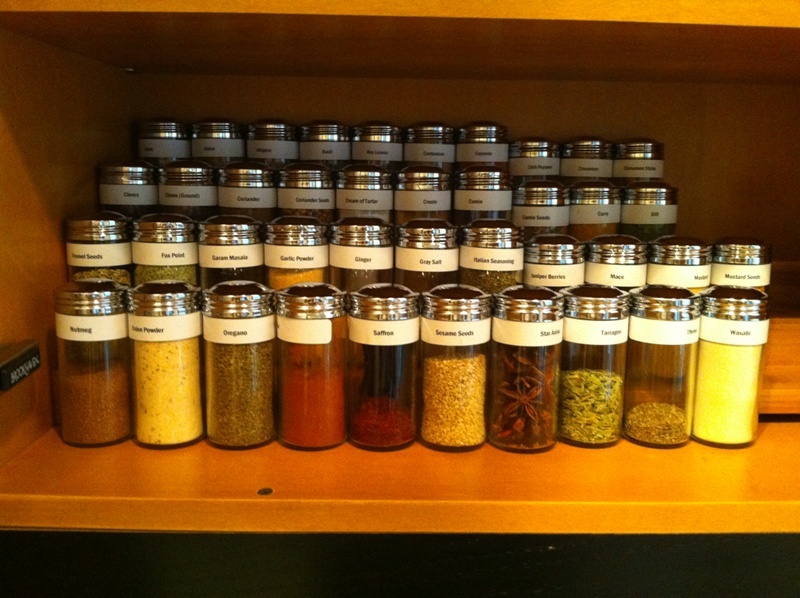 Much easier to organize 5, 6, 7 than by spice name. FORM. Helps me grab the "cinnamon sticks" not the "powdered cinnamon", the "whole cloves" not the "ground cloves". DATE. Let's me know how old, as some spices lose much of their flavor after a few weeks/months. If it's old, I consider using more (or replacing it). NOTES. Can contain just about anything, like "SAFFRON IS VERY EXPENSIVE. USE SPARINGLY!!!" The spreadsheet helps with re-ordering too. I just copy/paste the name into Penzey's website (http://www.penzeys.com) and I easily find what I need to reorder. You can add fields to the spreadsheet, like the product number at Penzey's for "Whole Special Extra Bold Indian Black Peppercorns". That definitely helps when it's time to reorder. Not the answer you're looking for? Browse other questions tagged storage-method spices organization pantry or ask your own question. Will storing spices on the oven affect flavor or anything? What should one look for in the license terms of a crowdsourced recipe website? Can I / should I keep spices & dried herbs in the fridge? What brand of tupperware-style (kitchen storage containers) are the easiest to clean?